Model 2000/3000/3600/4800 Hopper Feeders are used for feeding cylindrical type parts such as, cut bars, tubes, and shafts with diameter ranges within a 2:1 ratio. Parts are bulk loaded or hand stacked in multiple rows when part orientation is required. This feeder is designed for higher feed rates and gentle handling of the parts with lower noise levels. By design this feeder naturally orients parts with the elevator belt, thus eliminating recirculation of misoriented parts. Our Model 1650 Cross-Feed Conveyor mounted to the front of the elevator allows a continuous flow in an end-to-end orientation. These feeders may be used to feed centerless grinders, thread rollers, induction heaters for selective hardening or preheating for forging and many other applications. Feeds from a random loaded floor mounted hopper. The steel shafts are elevated from the hopper via a cleated belt and deposited onto a front-end mounted, cross-feed conveyor. The conveyor translates the parts in a continuous, end-to-end stream to the workrest of an Okamoto centerless grinder. Feeds track pins from a random loaded, floor mounted hopper. The track pins are metered from a tub into the hopper via a low level signal cycling a 6000# vibrating hydraulic tub dumper. Then the parts are vertically elevated from the hopper and discharged in a continuous stream onto a horizontal cross-feed conveyor and fed in a continuous stream to an air-operated transfer device. Then the transfer device loads pins into a load chute. Feeds steel bars from a manually loaded floor mounted hopper. The bars are elevated from the hopper via cleated belt and deposited onto a front mounted, cross-feed conveyor. 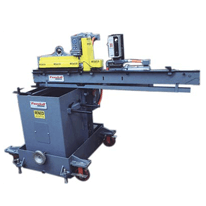 The conveyor translates the parts in a continuous, end-to-end stream to the workrest of a centerless grinder. Feeds input shafts from a random loaded, floor mounted hopper. The shafts are elevated from the hopper via a cleated belt and deposited onto a cross feed conveyor. The conveyor translates the parts in a continuous, end-to-end stream to an automatic, air-operated “shifting mask” orienting device. The orienting device discharges the shafts with threaded end leading, axis-horizontal onto discharge conveyor equipped with an air-operated transfer device to load four parts at a time into customer’s V-Nest loading an induction hardener.